The English Theatre Frankfurt has gained fame as the largest English-speaking theater in continental Europe. It has become a major player in the Rhine-Main region’s cultural scene since its foundation in 1979. 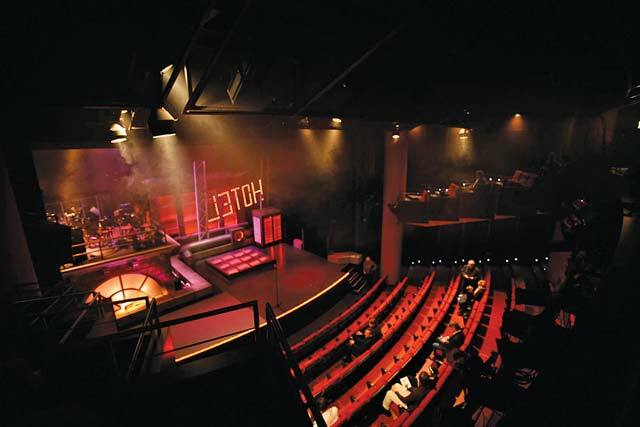 The theater audience is the youngest, most cultivated and wealthiest amongst all theater audiences in Frankfurt. More than 80,000 visitors per season enjoy its wide range of classics, comedies, thrillers and musicals — all produced in-house to the highest professional standards. Auditions and initial rehearsals take place in London and New York. Only then does the ensemble come to Frankfurt for final rehearsals and performances. The auditorium seats 300 and makes use of the latest audio-visual technology. The house bar, James, has two floors outfitted with cosy but contemporary furniture. It is an integral part of the theater’s ambience, functioning as a place for all kinds of events, including concerts, parties, readings, conferences and presentations. The English theater stands for educational and linguistic competence, and for the cultural exchange between the German and English-speaking communities. It is a place where the arts are at home. It is a theater for all, but also a place of literature (readings), educational art (exhibitions) and music (events). Due to its consistent, high-quality standards, international flair and function as a meeting point for people of all nationalities, it plays a pivotal role in the cultural life of Frankfurt, a city with the largest international community in Germany. The theater is famous for its musical productions. Last season’s musical “The Who’s Tommy” (Pete Townshend and Des McAnuff) was a massive hit and drew a huge audience. More than 36,000 people saw it, which makes it the most successful musical in the history of the theater. A theatrical firecracker, “Master Class” brings Maria Callas back to life in all her temperamental, tempestuous glory. Inspired by a series of master classes the great diva conducted toward the end of her career, she coaxes, prods and inspires students into giving the performances of their lives while revealing details about her own. As she slips off into memories, we experience her fierce hatred of her rivals, her triumphs at La Scala and her affair with Aristotle Onassis. But the dazzling theatricality comes from Callas’ emotional explosions, her cutting wit and the soaring music as each student sings an aria that exposes La Divina’s vulnerabilities. There’s nothing pure about goodness or badness. Welcome to Southie, a Boston neighborhood where a night on the town means a few rounds of bingo, where this month’s paycheck covers last month’s bills, and where endlessly self-sabotaging Margie Walsh has just been let go from yet another job. Facing eviction and scrambling to catch a break, Margie thinks an old fling who has made it out of Southie might be her ticket to a new start. But is this apparently self-made man secure enough to face his humble beginnings? Margie is about to risk what little she has left to find out. For more information on the English Theatre Frankfurt and performance times, call (0049)69/24231620, email box-office@english-theatre.de or visit www.english-theatre.de.